11 MN tribal nations Leaders, Gov. Mark Dayton, and Mayor Frey met; tribal leadership offered 2109 Cedar Av So., 1.25 acres, owned by Red Lake Nation (was Ambles), for a Navigation Center. All 11 tribal nations supported that site. Frey said: “Thank you tribal leadership, particularly Red Lake Nation. Today’s Council vote reaffirms that site is culturally appropriate and equipped to provide for the safety and health of people at the Franklin/Hiawatha Encampment. The City will prepare the site and work with the native community for a smooth transition while protecting everyone’s health and safety.” HN Cty, nonprofit partners and community will develop and implement the services at the Navigation Center with support from the City. 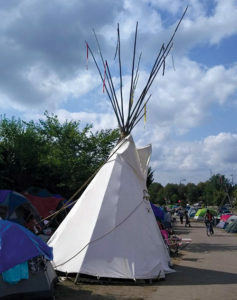 The Encampment will remain until Center opens this Fall. City and coalition partners recommended a new transitional housing program for Native Americans experiencing chronic homelessness. Minneapolis is on Dakota Land in MniSotaMakoce (Land where the water reflects the sky) and is now home to many Native people from across the state and across the country. The water, trees, and all living things growing out of the ground carry with them the spirit of the original Dakota inhabitants because this ground is quite literally saturated with the DNA of our Indigenous ancestors. These ancestors lived here for millennium before Minneapolis even became a city. This land continues to be sacred land for many of the Urban Native population. Despite hundreds of years of trauma and genocidal actions against us in this country, Native people are still here. We are resourceful, resilient, and committed to our community, families, and our cultures and traditions. However, we still face many challenges. Homelessness, chemical dependency, mental and physical health struggles, vulnerability to exploitation and violence are all by products of the generations of trauma experienced by our relatives. Though we are less than 2% of the population, we experience disproportionate rates of all these effects. 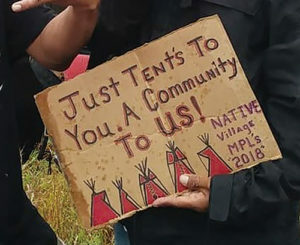 A simple cardboard sign with a profound message to people passing the “Wall of Forgotten Natives” at the Franklin/Hiawatha Encampment as medical and security issues are addressed and deliberations continue to alleviate the plight of many people temporarily and more permanently. In recent weeks many of our relatives have come together and moved into tents in the area along a soundwall on the east side of Highway 55. This community has become known as the Franklin/Hiawatha Encampment, or for some, the Wall of Forgotten Natives. Our community faces significant challenges to housing and many have been “forgotten” and erased by those systems that were set up to assist them. Finding safe and affordable housing is a long-standing problem in Minneapolis. 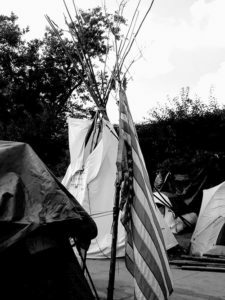 Housing shortages, rigid landlords, policies that create lifetime bans based on survival behaviors; these are just some of the things that create overwhelming barriers for many of our relatives and have created the environment for the Encampment. In response, a broad coalition of government, nonprofit, and community partners and stakeholders are coming together to address the short-term, mid-term and long-term barriers to housing for the residents of this camp, as well as those in other camps not so visible. Working together, we hope to find housing options for the camp’s population as soon as possible because we all acknowledge the current location is not sustainable, especially once the weather turns cold. This symbol, amidst tragic circumstances at the “Wall of Forgotten Natives,” calls for meaning from the viewer. We invite all to join us in this work. Please visit www.franklinhiawathacamp.org to see how you can help and to stay informed. Patina Park is the executive director of the Minnesota Indian Women’s Resource Center and the current chairperson of the Metropolitan Urban Indian Directors group. Pollen Midwest invests in human connection to fuel empathy and momentum for social change by sharing stories of critical narratives, hosting events where essential conversations happen, and linking people to new professional and personal opportunities.